Usually I’m a one major classic race per year guy. And normally it is Seeley hills classic. I opted to get my race season started later this year so I didn’t do that this year. I figured I would probably not do a classic marathon after that. 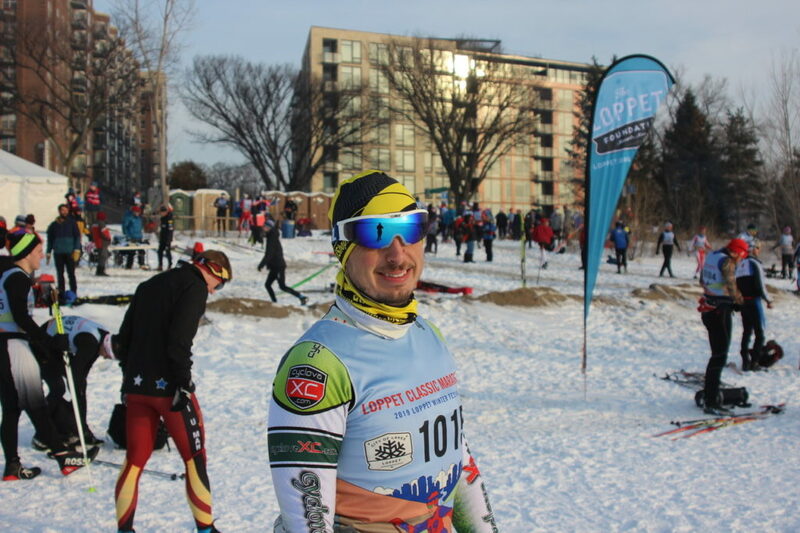 Turns out I had to travel for business the weekend of City of Lakes so I could just sneak the City of Lakes Loppet Classic Marathon in before running off to the airport. 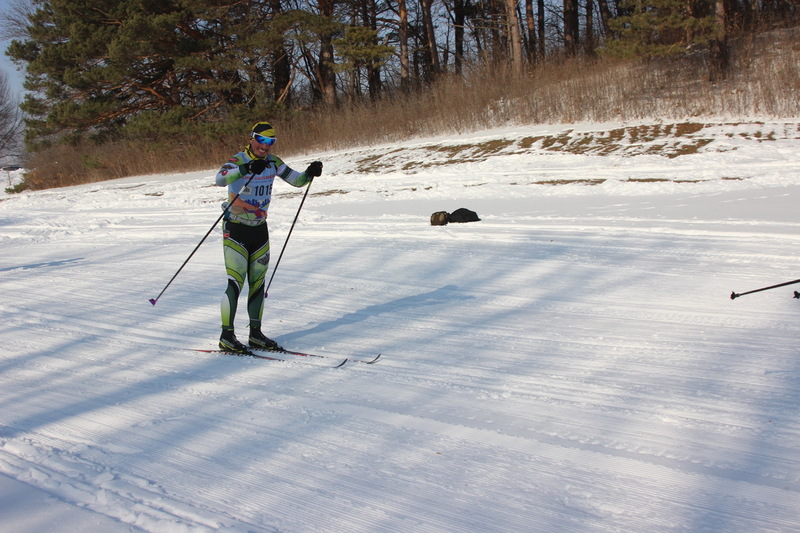 Following last weekend’s Noquemanon we stopped at the Birkie trail on the way home to “ski during the heat of the day”. Otherwise known as when it was about zero. We opted for a nice easy classic ski which was fantastic. I’ve been hitting the classic skis about once a week this year. But that has almost always been the recovery day. I’ve had one two hour classic ski about two weeks ago when it dawned on me that maybe I should do one long classic before I went all in for a classic marathon. 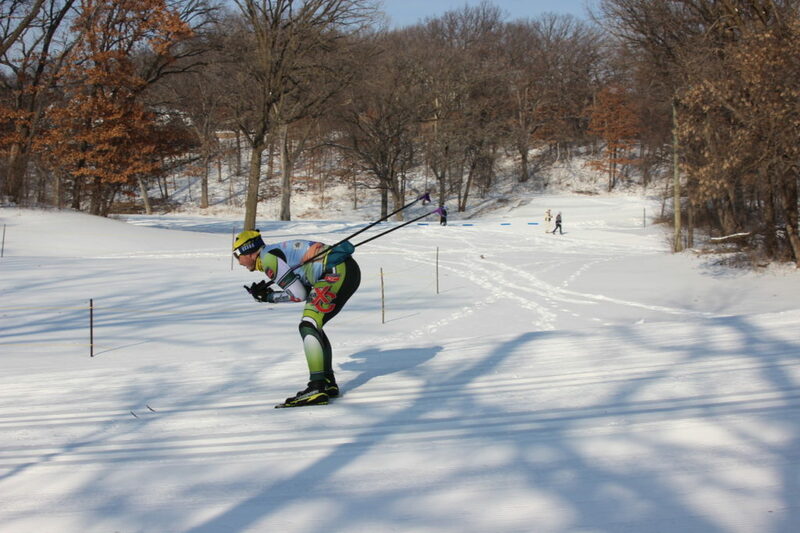 The only other classic skiing has been the Wednesday night races at Elm Creek, but those are mostly double pole. I’m still feeling pretty good about my training. Still getting the two hard workouts a week plus a long ski/race on the weekends. Hoping this peaks and pays off in a few weeks. I did have to hide inside Tues-Thur this week. Call me a wimp, but -15 isn’t going to make me a faster skier. So how do you wax for a race that starts on the lakes where you don’t need any kick and want great glide, then goes into the fresh snow in the woods with some punchy climbs, then out on the snow making loops with the long climbs? Oh, and it has been crazy cold for the last few days but is going to start around 16 degrees and will be pushing freezing or above with sun by the time you finish? Jay suggested I actually test some wax the night before. That was a novel concept for me. The air temp was holding steady from there until the start so it would give me something to base it on. So I headed over to Theo before packet pick-up to do some testing. Two pairs of skis with different glide and a pocketful of different kickers to try. End of the day the Fast Wax HSF20 felt the fastest. Kicking wise, Start Oslo blue and SkiGo HF Violet both kicked bomber, with Oslo gliding a bit better. Swix VR40 and VR45 kicked a little bit, but not very good, even when I was fresh. I ended up going Oslo Blue with a little cover of VR40 in hopes of having good glide on the lakes, no clumping in the woods, and then still kicking at the end when tired. Verdict? Actually it turned out great. 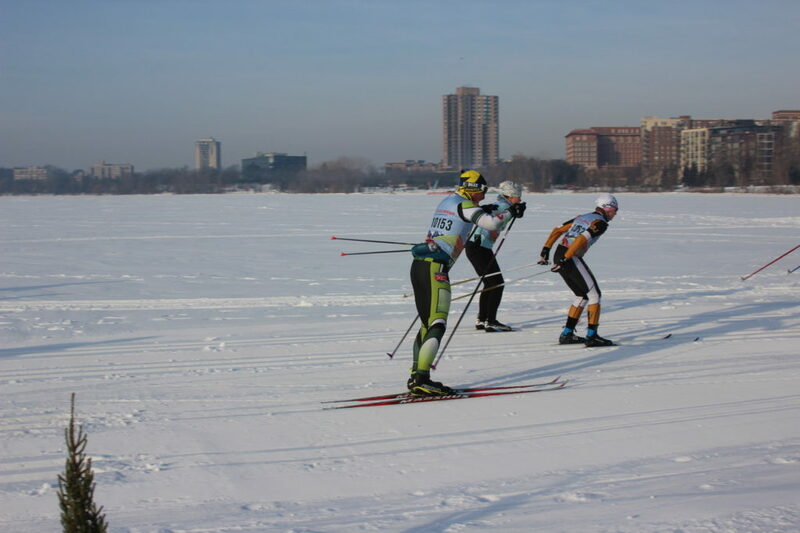 Skis felt fast on the lakes, a bit slow in the woods, but not clumping up and kicking well enough, then kicking great and running great on the manmade. Only issue was the short stretch from the Front 9 up to Trail 18. Whatever that snow was I had ZERO kick and was about to freak out thiking I had 7km of hills with nothing to kick with. Turns out it wasn’t an issue though. My honey gave me a ride to the start which was awesome. I was a little worried about parking so I wanted an option to jump out of the car and get to the start. It wasn’t an issue, but she got to watch the race and take a bunch of pictures. 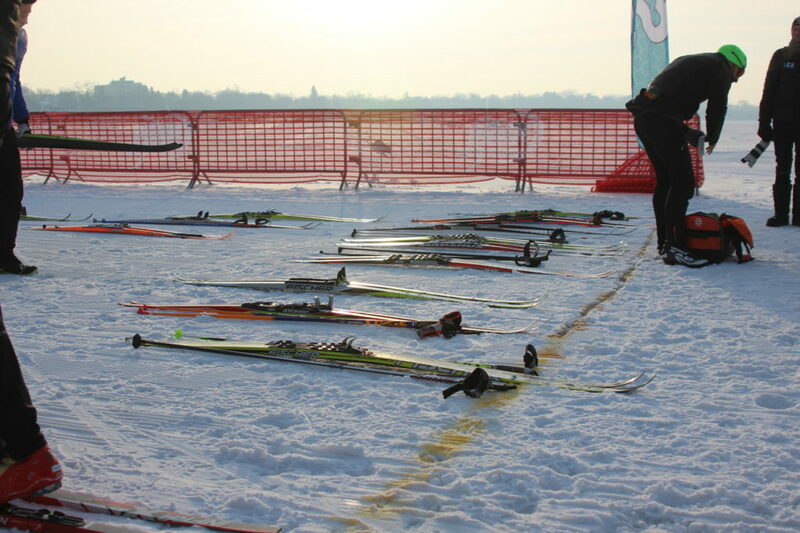 Skis on the start line. Winner Brian Greg getting ready. I started on the third row. Shortly after the start I found myself boxed into the side track. I wanted to go a bit faster, but there wasn’t anywhere to go. It actually happened a couple of times before getting off of Bde Maka Ska. Not the end of the world, but I might have found a faster group to double pole with. Scotty, who I skied at the Rennet with found me on the trail and was able to make a move and got away while I was boxed in. It was good to say hi on the lakes, but he ended up crushing it and there wasn’t anyway I was going to hang with him anyhow. Double poling actually was going pretty well which was a surprise. I would not consider my core/upper body strength an asset. I ended up skiing most of the first few lakes with the lead pack of women. Those gals can crush. But then we hit the first jaunt into the woods. Holy crap was that a different experience. We went from firm tracks to just some loose snow and leaves. And maybe some sticks and rocks. My HR shot through the roof (or I think it did, I somehow left my Scoche at home :(). I was all over the place and the group I was with disappeared up the trail ahead of me. We then proceeded to find tracks that were straight down to the grass in quite a few places. You had to keep your head up and switch tracks or step out momentarily. I pulled back a little group through Brownie but then got shelled again up to 55. From there first it was Jon Miller that went past me like a rocket. Then Dave Nelson came by. I managed to get my poop together at that point and ended up hanging with Dave until just before leaving the Front 9. I did some share of the leading in the sections across Wirth Lake and through JD Gardens and the Front 9. Somewhere in there Marit Sonneyson came by and was on a mission. I had been with Dave and one other guy from LNR for a little while. When she went by she tore our little group up. LNR guy followed and Dave tried. I got gapped a bit and then we hit the climb up onto the manmade loop referenced earlier where I had no kick and had a momentary panic attack. Pretty sure this was on the front 9 not too long before hopping over the Parkway. Still smiling I guess. Unlike Noq, I did try to do a little feeding this time. Not as much as I should though. I had a bottle with Tailwind that I did almost finish. And I had a gel just before hitting Wirth Lake. Feeding was hard on this course as there are no real downhills that you can eat on. If you stop skiing you stop moving. The zip down the tubing hill and the hard left hander around the Trailhead was sketchy AF. My opinion and I heard similar after the race, was that the track was set too far around the corner. I didn’t eat it, but I came dang close. So close to the finish… just all of the Theodore Wirth main trails to go. Dave was still within sight as we headed out to the Twin Lakes loop. I was probably fading a bit. Then Mike Brumbaugh and Drew Holbrook caught me in the middle meadow. It was time to get my poop together again. I got on Drew’s tails (not quite literaly) and held on. We were a little group up the Ridgeline climb and over onto the Judy loop. Ick. More super thin natural snow. Back to slow skis and wobbly footing. The big steep climb was where Mike made a move up the hill. 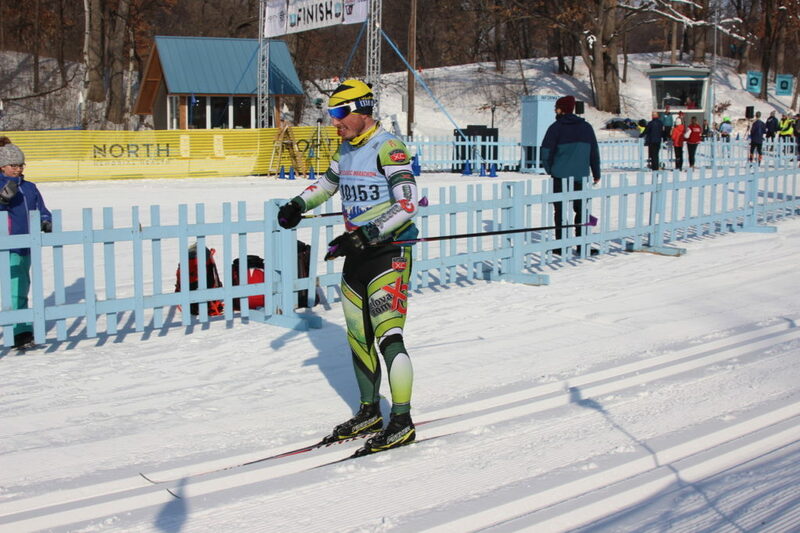 My B-skis are heavy and I was hating them herringboning up that hill. I couldn’t do much more than walk. He walked away from me while I put a gap on Drew. We also pulled back the young kid who had a killer double pole but had remarked earlier in the woods how he wanted to go back to the lakes. Just a spin back down the hill, a climb up the finger, down and up La Squadra and home free. Once I hit the La Squadra climb I started thinking I should dump what I had left. It wasn’t much. I do probably need to go a little earlier or a little harder throughout the race. One little bump, around the corner and the finish is immediately behind the photographer. I ended up finishing in 2:13:29 and 36th place overall. 4th in my age group for the second weekend in a row. 3rd place was Jon Miller and he had put about 3 minutes into me since the Bog. I’m not sure I really had expectations for this race. Classic racing gives me anxiety. Too much to worry about having to go the whole race with no kick, or no glide, or no kick and no glide. If we break the race into the three sections of the course I reported on we can look at that. On the lakes I did better than I expected. Maybe next year I can get double pole skills like Artie. It doesn’t come without work though. The first stretch of woods was a cluster. I’m not sure why my HR shoots up like that and I get all flooded. It would be nice if I could hold my stuff together in there. Perhaps more classic skiing to feel more in control. Or more VO2max/anaerobic work to be able to elevate for a little bit. I did pull my head out of my back-end when Dave came by so I felt good about that. I wanted to have more left when we got to the man made loops. But I didn’t completely blow up. I’ve done plenty of COLL where I blew up on those hills… and those have all started over there and finished on the lakes not the other way around. 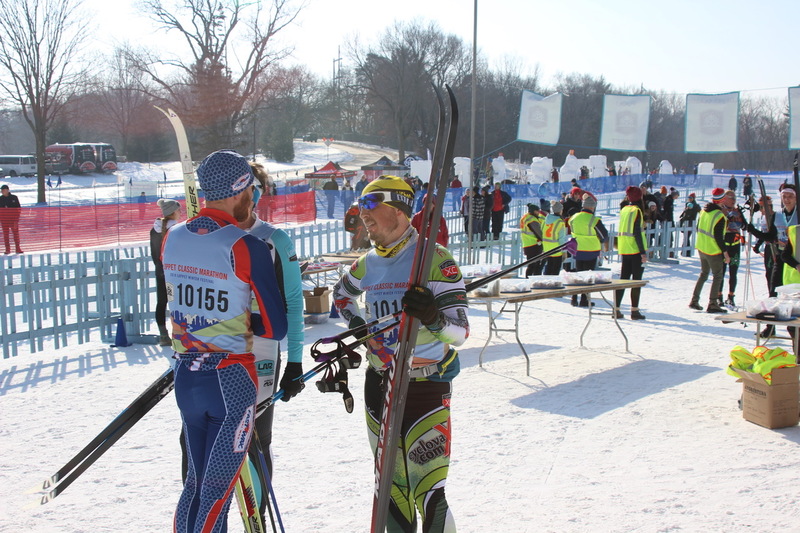 Immediate post race recapping with Dave Nelson. Objectively I continue to float the bubble. In fact, this years numbers look eerily like last years numbers as far as the predictor goes. One result showing 16x a handful in the 210-220 range and a clunker each year in the upper 200’s. Huh. 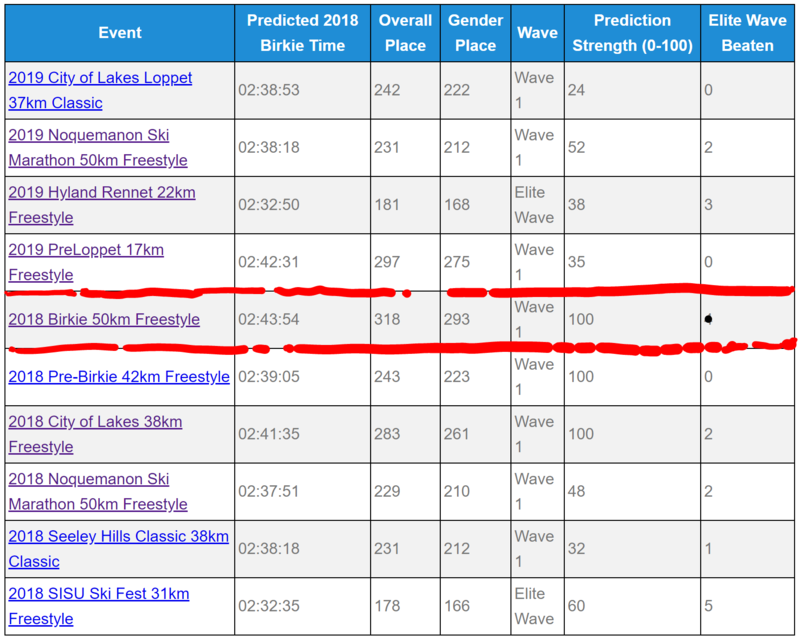 Note that the 2018 Birkie is the actual result (turns out the only perfect prediction is to actually do the race). I’m in San Francisco through Wednesday. Not going to be much skiing going on here. That is a concern as my options are going to be running or possibly a spin bike in the hotel gym. I’ve run three times in the last two months so that might trash my legs. 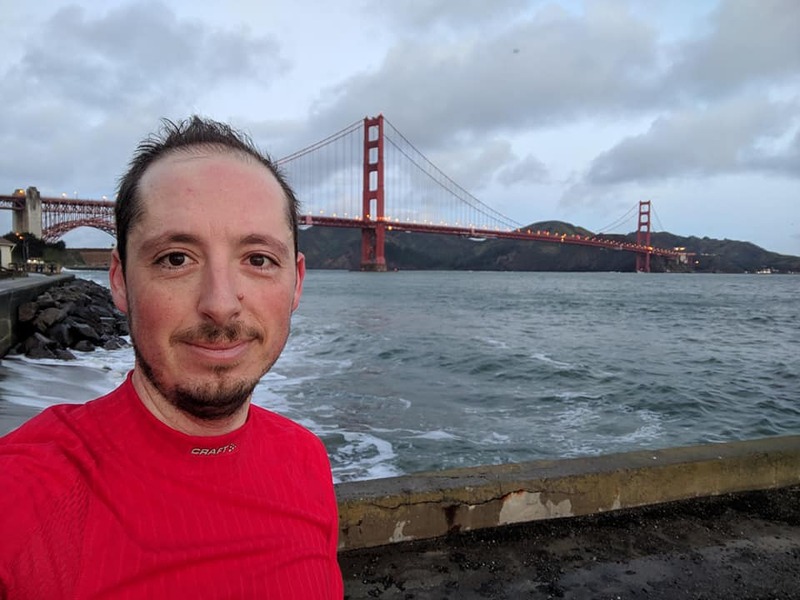 Midway into a 10 mile run. I can barely walk now. 52k Vasaloppet on Saturday. I’m looking forward to that one. I dig the course and am hoping for a fun pack race. Hopefully the temps are warmer than the last few times I did that one. No need for frozen eyeballs again.